My Brother: Check it out, the place is on Baby Ruth lane. Me: That's kind of cool. I want to live in Candyland. Me: Actually, I don't think I would. I bet no one in Candyland has any teeth left. Plus they all have diabetes. My Brother: ...I hadn't had a part of my childhood destroyed today, so I want to thank you for that. Princess Lolly and Queen Frostine were the only two women on the board.... Do you think either of them hooked up with Gloppy? Would you believe I've never played this game? Such a sheltered life. haha, nice. i never wanted to live in candyland, i was always about the clue mansion. Haha I just realized that the characters on the box all have closed mouths...Perhaps concealing their lack of teeth??? I loved this game! I want to play it now. I'll have to correct Asblackasobama. Grandma Nutt was also on the board. That's what's so dangerous about revisiting childhood: so many things seem just wrong today. This was my favorite board game as a kid. Actually, I suppose it still is. You guys hang in there! Forget about finding King Kandy!!! Whatever happened to Plumpy the Plumpa Troll? Poor girl. Maybe she got tired of being overlooked for Princess Lolly and Queen Frostine by all of the Mr. Mints and Asblacks of the world??? That shifty Mama Ginger Tree showed up about the time Plumpy went missing...maybe we should start the interrogation with her. I cannot believe I actually did research before commenting on a board game. Never again will I be able to look my husband in the eye, and claim that "I didn't have time". 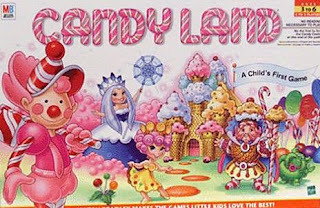 Candyland is the Ouija Board of children's games. 'nuff said. I was a 'Snakes and Ladders' man myself back in the day. You would be surprised at how easy it is to avoid the snakes when you can't yet count. They should make a Sugarless Candyland. I loved this game as a kid. In reflection, this might explain why I now like Glee. I see some of you talking about playing the game. I only played it once, I think when I was five-ish. So all this talk of characters is over my head. Kind of cool in a weird way though. Maybe I should pick up a game and see if it's fun. TS, it probably doesn't hold that much appeal if you didn't play it as a kid. It's super-remedial; you don't even roll dice. You just pick a card with a color from a deck, and then move your piece to that color. I think it's for ages 3 to 6. Ages 3 to 6? Perfect. That's about where my maturity peaked. That sounds like a conversation I would have with someone. I never played the game as a child; trouble and hungry hippos were my speed. But,I did buy it for my daughter. Gloppy the Molasses Monster need I say more? When you're a kid you lose all your teeth anyway.. course the diabetes and obesity would be annoying. I loved this game so much. I never, ever have won playing it - but as a candy lover and chubber, this was tops in my book! We never played it because we always thought it was a girl's game...sorry! But Plumpy was clearly a dude! He had a big giant Wilford Brimley 'stache!